My Spiritual Awakening began sometime in the winter of 2002 with a frantic phone call as I ‘needed’ answers! My situation was the fulcrum of my spiritual search for peace. After many calls in search for guidance, I found a teacher to help me start on this new journey. At this point, I had zero understanding of the chakra system or anything esoteric. Even though my personal life was in shambles my mind began to expand and I started to have vivid visions. In meditation, I had something like a “near-death experience” and soon after, the right people, events, and information came seemingly out of nowhere! I found an event by Sri and Kira called 2012: Quantum Leap in 2008 in Southern California. It was a large gathering of 500+ people. Sri and Kira, along with Don Jose Ruiz, and George Noory was the MC. Many vendors lined the halls. It was announced that Kira would call out five people by row and chair number to receive a message at the ceremonial altar in front of the stage. My heart stirred. I was scared. I didn’t want to be called. I sat in the back. Well, you know where this is going! Kira called out my row and chair number. I stood frozen. My husband, Michael, nudged me. I had been called. I looked at him and said, “No way!” I wanted to hide! To my surprise, a runner soon came and took me to the altar. Kira gave each of us a message. My message was, “Be the Lioness, and they will follow.” All these years ago and I still hear the message. Many times, it was my strength; my mantra. Later the same year, we enrolled in another event with Sri and Kira. It was here that I connected with the Ascended Masters and Archangels opening up my vision even more. I continued to follow Sri and Kira through their newsletter and Radio show and began to study their classes and many different modalities. One Sunday, Kira described a person that went from one program to the next searching for the right fit. She said that a student should stay with one program for at least a year. She said, “Give it a year. Anything less is not enough.” That’s when I made a commitment to stay with Sri and Kira. Their material was always beautifully presented, and easy to follow. 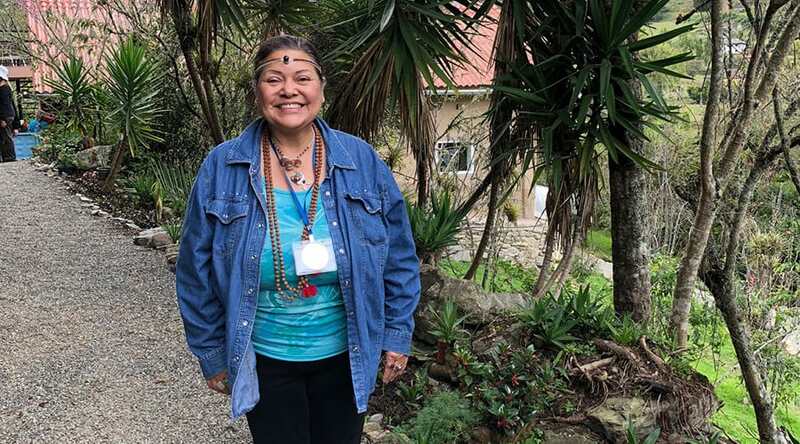 Last January I was able to attend the Avesa Balancing program in Ecuador. It was the most amazing event! TOSA Blue Mountain is crystalline pureness! I came home with a deeper sense of my place in the cosmos, and a peacefulness I’ve never experienced. That is when I committed and joined the Miracle Team! The support of the Miracle Team presence in my life is an incredible blessing.